Garlic clove, minced 1 ea. Reserve 1/2 cup of the corn kernels and puree the rest with the heavy cream in a food processor or blender. Reserve until needed. Put the bacon in between 2 paper towels and microwave at P10 for 2 minutes. Crumble, reserve until needed. Put the onions, red pepper, celery, and garlic with a 1/2 cup of the chicken stock in a 2 qt. microwave bowl and cook at P10 for 4 minutes, stirring once. Add the rest of the broth, potatoes, and tomatoes, including their juices. Cook at P10, covered, for 5 minutes. 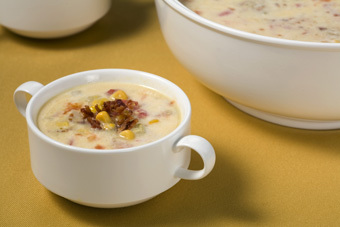 Add the pureed corn and cream, the reserved corn kernels, the chilies, cheese, and crumbled bacon. Microwave at P10, covered, for an additional 5 minutes. Adjust seasoning with salt, pepper, and Tabasco.